Management Staff of Faber Stone & Tile travelled to Chicago last month to visit the Coverings '16 Trade Show. More than 25,000 industry professionals attended the week-long expo, April 18-21, 2016. This figure is an increase in overall attendance from the 2015 show, and to industry insiders, affirms positive movement in the tile and stone market. 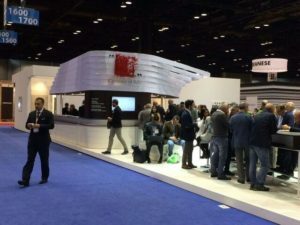 The 25,000-attendance count is a remarkable 15-percent increase from 2009, the last year Coverings was held in Chicago. Some notable emerging trends that our Team picked up on were: 1) Rustic exposed brick-look porcelain wall tile, 2) Three-dimensional glossy wall tile, 3) Antiqued/worn carpet looking porcelain floor tile, 4) Updated hexagonal shapes, and 5) Expanded format wood-plank look porcelain tile. Watch for Faber to add these cutting edge looks to our portfolio in the coming months.